is a 20 year old Natural Lycanthrope Crossblooded Sorcerer. Her bloodlines are Elemental (Air) and Draconic (Silver). 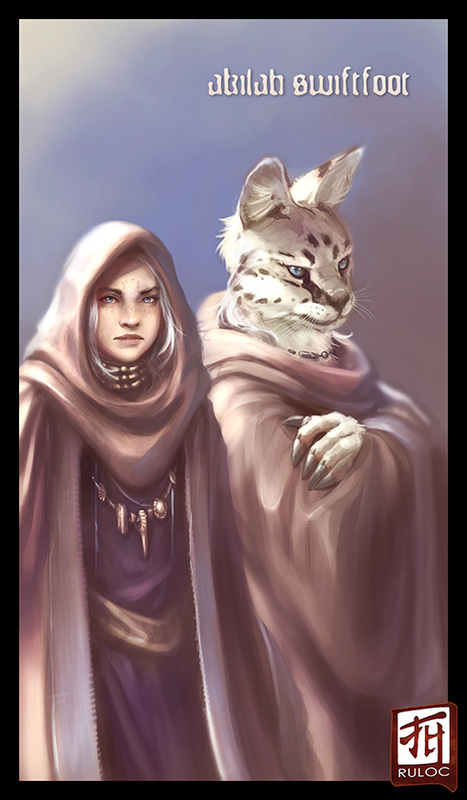 I would love to see both her human and her were-serval forms if possible. The descriptions will be more of when she's manifested elements of her bloodlines. Their facial structures are very similar, but Akilah's hair is a silvery white. She also has freckles reminiscent of her Serval form, and some very light silver dragon scales mixed in with her pale human skin. Her eyes are an icy blue color. She does not have a tail nor does she have wings. Her hands have become a bit claw-like at the fingertips. I have contemplated on whether or not she has small silver dragon-like horns. I can leave that up to you if you feel it fits her image. For her hybrid form, Akilah is a were-serval, though her fur has become silver instead of the tawny color of a normal serval. All the black markings remain (including the four arching spots she has on her forehead as her signature spot pattern. There is otherwise no set spot pattern elsewhere). Her eyes are the same icy blue as her human form. For her hair, its more or less intermixed with the fur along the back of her head and neck, and it is also silver in color. She's extremely inquisitive, and has a bit of a sarcastic streak when it comes to humor. While growing up, she was known for pulling pranks on her mentor and had disliked reading. This has changed quite a bit as she began adventuring (she is absolutely fascinated by dragons, which have not been seen for centuries in her world, and that was before she found out she has dragon blood). For clothing, she tends toward more earthy colors and wears no shoes in her hybrid form. Her clan is from a forest that borders the desert, so that gives a bit of an idea on the sort of clothing she prefers. She is not afraid to get her hands dirty, fighting both in melee with her claws, and with her magic at both close and far ranges. She does have a spellstoring dagger, but its more for her human form than when she is in hybrid form. She spends most of her time in hybrid form unless she is in town.